Contributing to economic development by providing a viable environmental solution, Water Purification System Bio-Sun BS340 gives rural populations in developing countries access to pure, healthy water and also provides drinking water to isolated areas everywhere in the world. The power of the Water Purification System Bio-Sun BS340 ` UV reactor has been calculated to be able to treat the equivalent of 500 litres/hour with 400 J/m?, which represents the dose required to make water drinkable in all the developed countries. Due to its photovoltaic power supply, this terminal has been designed to operate for approximately 4 hours/day, and therefore to have a run time of approximately 3 days and supply about a hundred persons with 25 litres of water each daily, the vital requirements defined by the WHO. Established in 2001, Phaesun GmbH is a German company with its Headquarters in Memmingen, Germany and its manufacturing facility in China producing high quality off- and on-grid energy efficiency products like solar charge controllers, wind charge controllers, hybrid solar/wind charge controller, wind turbines, off-grid solar panels and accessories, solar batteries as well as off-grid appliances focusing. 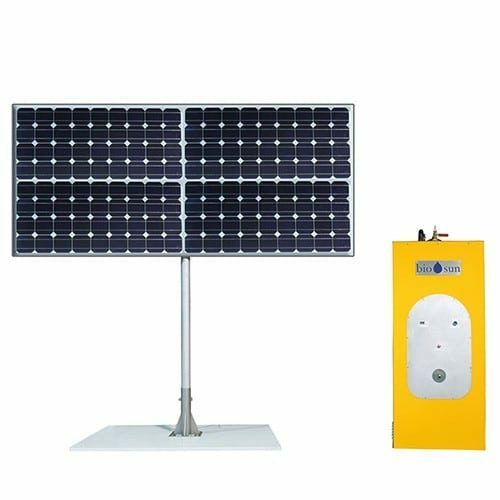 The multiple Intersolar and Energy Globe Awards winner has a more than 20 years track record in off-grid renewable energy solutions. The company has several subsidiaries in African countries as well as in France, United Arab Emirates and Panama. As one of our strategic partners, Phaesun GmbH shares the same values as ZEROhomebills.com and Solaranna Limited: that free energy is available for everyone; furthermore the off-grid renewable systems are a contribution to the individual independence of everyone on Earth. Join our ZERO Home Bills Community. BEST Products from the BEST at the BEST Prices available in your market delivered by Solaranna.